Today I spent much of my time crawling around on hands and knees, picking pieces of rubbish from the innards of the ATLAS detector. It’s just one of those things that comes with the job and gives you a different view of the experiment (literally.) 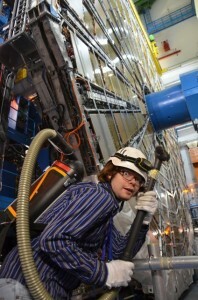 Before we start taking data we need to make sure that the ATLAS cavern is clean and safe. I call this process “Grooming the Beast”. Armed with a proton pack (I mean a vacuum cleaner) I take on the dirt and debris of the ATLAS cavern!